Carte de Normandie ou sont marquez exactement Les Pays ou Contrees enfermees dans cette Province aussi bien que les Villes, Bourgs, Paroisses et autres lieux. 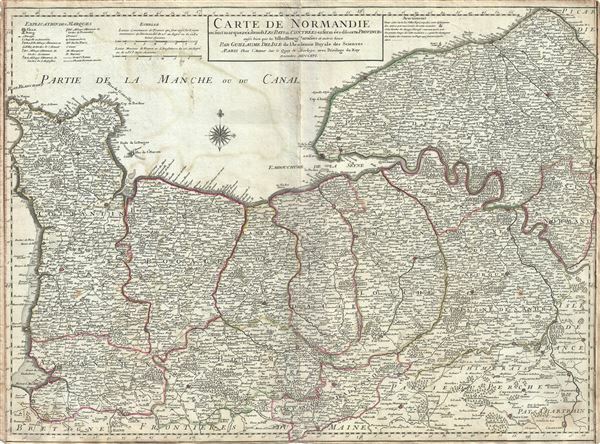 An attractive 1716 map of Normandy, France by Guillaume De L'Isle. It depicts the former French Duchy of Normandy and includes all or part of the departments of Calvados, Manche, Orne, Seine-Maritime and Eure-et-Loire. The map covers the region from Cherbourg south as far as Pontorson and from Chartres north to Le Treport. The map renders the entire region in extraordinary detail offering both topographical and political information with mountains and forests beautifully rendered in profile. Some coastal features are also indicated. Near the city of Vernon, the map identifies the area of Giverny, where impressionist Claude Monet's home and garden can be seen. The city of Chartres, also noted on this map, is home to the famous Chartres Cathedral. Camembert (here identified as Camembret), is a village where Camembert cheese was first developed. Camembert is a soft, creamy, surface-ripened cow's milk cheese, similar to Brie. The region of Calvados is known for its production of Calvados, the world's finest apple brandy. The top left quadrant of the map includes a key while an 'Avertisement' appears in the top right quadrant. This map was published by Guillaume De L'isle in 1716. Very good. Minor wear and verso reinforcement along original centerfold. Some offsetting. Narrow margins. Minor red markings along left border.